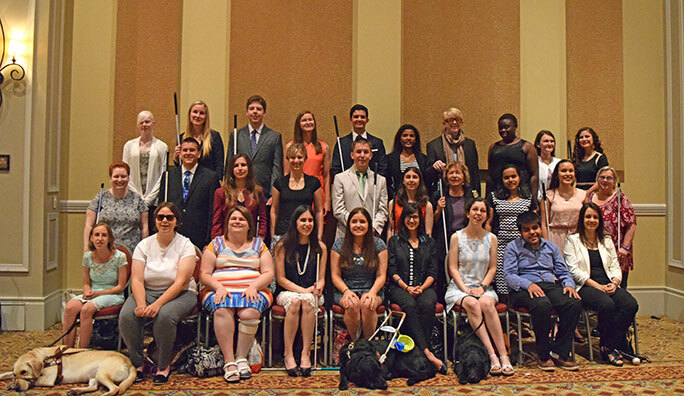 From the Editor: With every passing year we recognize the increasing value of the National Federation of the Blind’s scholarship program to our national organization. Members of previous scholarship classes stream back to take part in convention activities and assume responsibility, doing anything that they can see needs to be done, including serving as mentors during the following year for the members of the current scholarship class. Each July everyone looks forward to meeting the new scholarship class and to hearing what its members are doing now and planning to do in the future. This year’s class had three tenBroek winners, meaning that they have been previous recipients of a National Federation of the Blind scholarship. I won a scholarship way back in 1985 in Louisville, and in fact some of the mentors who mentored me are still on the committee. I intended to take the money and run as fast as I could, so I hope that this year's class is just as successful at doing that as I was. Tara Abella, Indiana, Indiana: Thank you, Patti Chang and board of directors. I am so honored and humbled to be here today. I will be a senior at Ball State University, double majoring in elementary education and special education. One of the reasons I wanted to go into education is that I believe that there needs to be reform in education. I want to work with students from low income families in an inclusive setting. Through the convention I've realized that reform needs to take place here, too, in the policies, in the attitudes that affect people who are blind in order to reach equality. I want to give my leadership and my mentorship and my heart to all of my students and to the National Federation of the Blind so that we can attain the dignity and respect that we deserve, as well as live the lives we want. Thank you very much. Justine “JJ” Aragon, Colorado, Colorado: Good morning, everybody. Thank you, Patti Chang, thank you, board of directors. I am a senior at the University of Northern Colorado. I'm studying human services with an emphasis on rehabilitation. I also hold minors in English and special education. I serendipitously joined the NFB in 2013 after not winning an NFB national scholarship, and the last three years have taught me so much. I have learned what amazing opportunities I have had in my life that not all blind people had, number one being that I learned Braille when I was four. I have also learned how many opportunities that there still are to come in my life that I intend to take full advantage of. I am so excited to continue to work in the NFB, and my passions within the NFB are membership and outreach. I want to bring more people in and bring those opportunities to our nation's blind, so thank you. 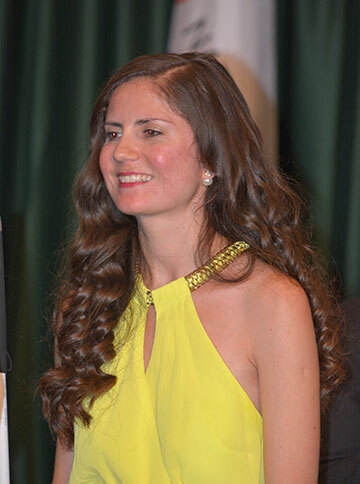 Deniz Aydemir-Doke, Pennsylvania, Pennsylvania: Hello, and thank you, Ms. Chang and board of directors. It is an honor to be here. This is my third time at the National Convention, and it is my third year in the USA. I am originally from Turkey. I am studying counseling education and supervision at Penn State. This is going to be my third year in my program as well. I am interested in my research, and I am interested in post-secondary transition of blind youth so we can lead the lives we want. I am also interested in microeducation in daily living and counseling settings. I am an advocate for a long time both here in the USA and back in my country, back in Turkey. I continue to be an advocate with my Federation family through my research and daily living as well. I am grateful to be here; I love being part of this family, and I hope you have a great convention. Samrawit “Sam” Biyazin, Oregon, Oregon: Hi, all. My name is Sam from Oregon. I am originally from Ethiopia. This is such a privilege to be here, standing in front of you guys, and thank you so much to the committee for choosing me. Back home I was a lawyer, and now my goal is to become a CPA and treasurer of the National Federation of the Blind. This will happen only if you guys will remember to vote for me when the time comes. Until then, I'll keep learning. Thank you. Megan Borella, California, California: Good morning, everyone. First I would like to thank the scholarship committee and the National Federation of the Blind for giving me such an amazing opportunity. It is such an honor and a privilege to be here with you today. I am from California, and I am going to be a freshman at UCLA. I am currently majoring in business economics, and I hope to take classes in computer science and learn more about programming. In the future I hope to go into business, potentially with an emphasis on programming and coding and computer science. Thank you all. Riki Danielle Burton, Kentucky, Kentucky (tenBroek Fellow): Good morning, fellow Federationists. It's a pleasure to be here this morning. I want to say thank you to the scholarship committee for having me here today. I am currently a senior at Morehead State University. I'm majoring in elementary and special education with an emphasis in moderate to severe disabilities. Then I will continue on to get my certification as a teacher of the blind and visually impaired. I love teaching blind children how to be independent and that nothing can stop them and not to let anyone hold them back. Thank you again to the scholarship committee for having me here. Thank you. Brennan Carman, New York, Connecticut: Hello, everyone, I'm Brennan. I'm going into my freshman year at Yale University, and I'm studying biochemistry. Hopefully one day I will do translational research to help address upcoming medical issues like antimicrobial-resistant diseases. This is my first experience with the Federation, and it's been really amazing so far getting to meet all of my fellow scholarship finalists and all of my mentors so far and all of you, and it's been really amazing and one of the most inspirational experiences I've ever had, actually. So I wanted to thank the Federation and the scholarship committee in particular for giving me that opportunity. Merry-Noel Chamberlain, Nebraska, Oregon: Hello, everyone. I am so happy to be here with my NFB family. My daytime love during the week is being a teacher for students with visual impairments and an orientation and mobility instructor outside Omaha, Nebraska. My evening and weekend love is working on my doctorate degree through Concordia University in the area of educational leadership, and my dissertation is focusing on orientation and mobility. My all-time love is being a parent of a blind teenager, who I just found out is helping out in the Independence Market. I thank everybody for being here today; I'm so excited to be with my NFB family, and I'm happy and honored that I am here today as a scholarship winner. Thank you. Nathan Clark, Maryland, Maryland: Good morning. My name is Nathan Clark; I am from Maryland. I am attending Towson University in Towson, Maryland, majoring in criminal justice, sociology, and anthropology with a goal to be a juvenile probation officer working with at-risk youth in the juvenile justice system. I am currently the vice president of the Maryland Association of Blind Students and the legislative chairman for that committee for the division. I am also a proud graduate of the Louisiana Center for the Blind, and this is my eleventh National Convention. I want to thank the scholarship committee, my mentors, and my fellow scholarship winners for an awesome experience so far this week. God bless the National Federation of the Blind. Elif Emir Öksüz, Ohio, Ohio: Good morning, everybody. I'm so glad and honored to be here as a scholarship finalist. Thank you to all of the scholarship committee and NFB. I am a mental health counselor, and I am a counselor, education, and supervision PhD student at the University of Cincinnati. I am coming from Ohio, but I am from Turkey originally. I would like to be a faculty member and educate counselors—mental health and school counselors—to work with people with disabilities when they need counseling from a multicultural counseling perspective. Hopefully I will be able to do that, and I will be able to practice as a mental health counselor. My journey with the NFB started four years ago. As soon as I arrived in the United States, I reached out to the Cincinnati chapter of Ohio, and I would like to thank Ohio and Cincinnati for making my adjustment very smooth and easy. NFB as a family has motivated me to learn Braille. I'm still in the process, but the more I become involved the more I strongly feel that I need to do it as soon as possible. Thanks for the motivation and support to everybody, and have a great convention. Laura Etori, New Jersey, New Jersey: Hello, everybody. My name is Laura Etori, and I'm from Kenya, but I live and study in New Jersey. I go to Rutgers University Newark, and I'm majoring in finance and actuarial science. I want to be an actuary. My vocational goals are to be in consultancy and eventually teach actuarial science to blind and visually impaired students because we need more blind actuaries. I would love to give a big thank you to the scholarship committee for giving us this chance. I would like to give a big thank you to the NFB and also my scholarship finalists; I would love to congratulate all of them. I know I might have a bit of an accent, but I'd love you to listen to what I have to say next very carefully: for those of us who are here I would love to challenge you: think of the people who have come ahead of you. Because, if it were not for them, we wouldn't be here. And we all have to learn how to give, because that's the message I'm getting from this board meeting today. We all learn how to give; that's the only way we can grow and become better people. So thank you once again, and I hope you all enjoy yourselves. Have a good day. Jameyanne Fuller, New Hampshire, Massachusetts: Hi, everyone, my name is Jameyanne Fuller. I am from New Hampshire. I graduated from Kenyon College in 2014. I spent a year teaching English in Assisi, Italy, on a Fulbright scholarship, and then I spent another year volunteering for the New Hampshire Disability Rights Center. This fall I will be a 1L [first year law student] at Harvard Law School. I am very interested in studying and hopefully practicing in the area of disability law and policy. This is my very first NFB convention experience. I want to say thank you so much to everyone who has welcomed me so warmly and enthusiastically and a huge thanks to the scholarship committee for giving me the opportunity to meet the NFB and explore the NFB. I've personally faced discrimination in academics, in my daily life here in America, abroad in Italy, and others have advocated for me, and they have taught me to advocate for myself. Now I am aiming to advocate for others and pay it forward so that everyone can achieve their dreams. Thank you. Deanna Greco, New Jersey, District of Columbia: Hello, everyone. I'm very excited to be here. This is my first convention, and I swear that by the end of the week I will be saying "live the life that I want" in my sleep. But honestly that sleep doesn't sound like too bad a thing because I am exhausted. I recently graduated from Camden Catholic High School in my home town of Cherry Hill. I was in every academic honor society, I was president of the French Honor Society, and I graduated fourth in my class, which I see as a big accomplishment—I'm proud of myself. This fall I will be starting at the Catholic University of America in Washington, DC. I will be studying biology on the premed track. My ultimate goal is to go to medical school and become a neurologist. I want to practice neurology as well as conduct research on diseases such as Alzheimer's. I find it very important that diseases that have memory loss get treated, because the one thing nobody can take from you is your memories, and I want to help prevent those diseases. Lastly, I would like to thank the scholarship committee for giving me this wonderful opportunity. Thank you. Maria “Conchita” Hernandez, District of Columbia, District of Columbia (tenBroek Fellow): First I want to thank the members of the scholarship committee, members of the board, and President Riccobono for believing in me and selecting me as a scholarship finalist. I'm a teacher of blind students in Washington, DC, and I'm tired of professionals telling us that our blind students will not get Braille because they have too much vision. In the Federation we know that Braille is vital and leads to success. They say there is no research that proves we need it. We know what we need, and as Dr. Maurer said today, we will not wait for it. We will conduct our own research that will lead to the independence of our blind students. That is why I am pursuing a doctorate degree at George Washington University to do research on learning media assessments for blind and low vision students. I could not do any of this without my Federation family, who taught me Braille when no one else would, and now I hope to pass this on to others. Thank you. Nazanin Mina Heydarian, Texas, Texas: Good morning, everyone. My name is Nazanin Heydarian, and I'm a PhD student at the University of Texas at El Paso. I have a master's degree in clinical psychology, and I'm working toward a PhD of health psychology. I am interested in conducting research to improve the communication between health care providers and people with disabilities from the perspective of people with disabilities. My career goal is to become a research scientist at a medical school, where I will pursue my research interests in the applied setting. This is the second day of my first NFB convention, and I have already learned so much from mentors, other finalists, and convention sessions. I will bring back these learnings to my community back in El Paso, Texas, and my work as a researcher. I'd like to congratulate the other finalists, and I'd also like to thank the scholarship board and the funding mechanisms that make this opportunity to support blind scholars in a significant way possible. I am humbled to be here, thank you very much, and enjoy your convention. Sharon Jose, Virginia, Virginia: Thank you, Ms. Patti Chang and the board of directors for allowing me to speak here. I just graduated from high school and will be a freshman at George Mason University this fall majoring in computer science. I have had the opportunity to work in the neural engineering lab at GMU for the past two years. I would like to continue interdisciplinary research in neuroscience and artificial intelligence, and I hope to pursue a career in the computer science and engineering fields. I heard about the NFB through this scholarship program, and this is my first convention. I am truly grateful to the scholarship committee and the Federation for selecting me as a finalist and welcoming me into the Federation family. Thank you so much. Matthew Miller, Illinois, Michigan: Hello, my name is Matthew Miller, I have just graduated high school, and I'll be beginning my first year at Michigan State University this coming fall, studying actuarial science. I would also like to thank the NFB. While this is my first convention, I attended several programs when I was younger that encouraged me, such as the STEM EQ program, which really encouraged me to pursue a STEM field, even when people—even my own parents, in a loving way—were discouraging me, because they worried about whether it was possible. The program showed me it was possible, and part of the reason I plan to join the ever-growing population of blind students and blind employees in STEM fields. James Garret Mooney, Arizona, Arizona: Good morning, everyone. First I would like to thank the committee and the Federation for awarding me this scholarship. I am a senior at Arizona State University, where I will attend law school in a year and hopefully practice family law. Being a scholarship winner has been one of the most rewarding opportunities I have ever had. Being mentored by this committee has shown me that the Federation does exactly what it says, and it changes what it means to be blind. And we show everyone here that we can live the lives we want. Thank you. Kathryn “Katy” Olsen, Iowa, Iowa: Hi, everyone, my name is Katy Olsen, and I'm from Granger, Iowa. I'll be entering my junior year of my undergrad this fall at Central College. I'm a double major, majoring in kinesiology and psychology. After my undergrad I hope to attend physical therapy school to get my doctorate in physical therapy and hopefully work with children. I also do a lot of mission work, and I'm really passionate about that. I'd really love to do something involving that, maybe going over to Haiti—it's one of the locations I do most of my mission work in. I would love to go over and empower blind people overseas. I really want to thank my scholarship mentors and the scholarship committee for this great opportunity. I'm looking forward to a great week. Thanks. Chelsea Page, Louisiana, Louisiana: Good morning, Federation family. I would like to first thank the members of the scholarship committee, as well as the NFB board and the NFB as a whole for allowing me to have this wonderful opportunity. I am attending Louisiana Tech University, at which I am attaining my masters of arts in teaching blind students, where I want to work in particularly with blind infants and toddlers and their families to ensure that they get the services they deserve so that the blind students can live the lives they want and compete on terms of equality with their sighted peers. Precious Perez, Massachusetts, Massachusetts: Hi, everyone. I am thrilled to be here today. I will be starting my freshman year at Berklee College of Music in the fall, and I plan to pursue a double major in music education and vocal performance in the hopes of changing what it means to be blind by living the life I want and teaching others to do the same. I am immensely grateful for this opportunity. Thank you, Patti Chang, thank you to the scholarship committee, thank you board of directors, and to my Federation family; I love you all so much. Thank you. Donna Lynn Posont, Michigan, Michigan: Hello, Federation family; I'm really glad to be here. Yesterday I realized that this is not my first NFB scholarship. I remembered that, in 1974 when I graduated from high school, I was given a scholarship by the National Federation of the Blind of West Virginia to attend college in the fall. The reason I have that to be quite so memorable is because I was going for a degree in biology. But one week into school my dreams got rerouted because no one knew how to teach a blind girl about biology or chemistry, and I sure didn't know how to learn, because I had no skills of blindness. I graduated with a degree in social work and headed off to Philadelphia to have a job there, but thankfully the greatest thing that happened was that I met the National Federation of the Blind and attended my first national convention in 1979 in Miami Beach. Fast forward thirty-four years later, after rubbing shoulders with many blind people, especially blind parents and blind vendors. I still wanted to learn about the science stuff, so I went back to the University of Michigan, where last year I graduated with a degree in environmental studies. I started a Birding by Ear and Beyond program in the environmental center. After I graduated I was hired to continue that work there with the university, and I am so thankful to have gotten this scholarship so I continue and will be able to continue to be a graduate student while I'm working at the university. Thank you so much. Syed Rizvi, Massachusetts, Texas: Brought to the United States by my parents, in part to escape genocide but also in the hopes of seeking a bright future, to our dismay the streets were not paved with gold. Blindness began to consume my life, but luckily I was found by the Federation, and they guided me to put on hold my undergraduate education, quit my job, and move two thousand miles away to LCB. There I not only gained the tools I needed to live the life I wanted, but also learned from mentors like Pam and Roland that blindness didn't have to dictate my happiness. With newfound vigor I threw myself into work for the Federation. I currently stand as the MASSABS [Massachusetts Association of Blind Students] president and now the NABS [National Association of Blind Students] second VP. I'm working this summer for the Massachusetts State House in Boston to enforce ADA compliance. In the fall I continue my college education at the University of Texas at Austin. One day I will be the best civil rights lawyer in the world, fighting for all underrepresented minorities. Thank you. Joe “Dexter” Rowell, Massachusetts, Massachusetts: Hey, everybody. First off I'd like to thank the NFB Scholarship Committee for giving me this opportunity. I'm a rookie at convention, and the time I've spent has been really, really inspiring. I graduated in 2014 from Northeastern University, and in the fall I'll be a 1L law student at Northeastern School of Law. One of the things that my blindness has taught me is something about social alchemy. What that means to me is taking resources and things that have been underused and overlooked and turning them into gold. I hope to use my skills that I learn as a lawyer to bring economic development and food justice to those areas most in need of social alchemy. One of the things I'd like to close with is that one of the other things my blindness has taught me is about patience. Through that, I've learned that life is about who makes it, not about who makes it the fastest. Kartik Sawhney, California, California: Good morning, everyone. My name is Kartik, and it's a pleasure and an honor to be here. Thank you, scholarship committee and the NFB, for not only the scholarship but for my first—but definitely not my last—convention. I will be a senior at Stanford University majoring in computer science with a focus on artificial intelligence and human/computer interaction. I grew up and spent most of my life in India, where I personally faced several challenges, especially studying sciences. I also saw many of my friends facing the same challenges, and that was when I decided that things had to change. So I developed technology that can empower blind students across the world to truly live the lives that they want, and with the Federation I think we definitely will be able to achieve a day when all blind people around the world can live the lives that they want. I am looking forward to getting to know you, learning from you, and working with all of you. Thank you. Kennedy Stomberg, Minnesota, Iowa: Good morning, everybody. I am going to be a junior at Coe College in Cedar Rapids, Iowa. I am studying neuroscience, and after my undergraduate I would like to pursue some sort of research, because I am really, really fascinated and interested in learning how biology and chemistry affect the way that we think and behave. I really love being here at convention, and I am super grateful to the committee and happy for my fellow scholarship finalists. Thank you. Corgan Waters, Tennessee, Tennessee: Hi, my name is Corgan Waters. I am from Dayton, Tennessee. This fall I will be attending the University of Tennessee as a biology major on the premed track. I will be working toward becoming a pathologist, and I would like to eventually work in regenerative medicine with stem cells. I think that medicine has come very far, but it has a very long way to go, and I would like to be a part of that. Ghandi did say, "Be the change you wish to see in the world," and that's exactly what I want to do. I would like to thank the scholarship committee and the entire Federation for giving me the opportunity to be here. This is my first time at convention, but it definitely won't be my last. Thank you. Kathryn Webster, Connecticut, North Carolina (tenBroek Fellow): Good morning, my Federation family. Thank you, President Riccobono; Chairwoman Patti Chang; the scholarship committee; and the entire National Federation of the Blind for providing me with this incredible opportunity. I am a rising senior at Wake Forest University studying statistical business and computer science. I would not be and could not be succeeding in these courses if it was not for the National Federation of the Blind. This organization has taught me and continues to teach me the necessary tools to advocate, educate, and compete on an equal playing field with our sighted counterparts. Let us continue to change and to challenge our limits as proud members of the National Federation of the Blind. Thank you. Kassidy Wilde, Utah, Utah: Hello, Federation. I will be attending the University of Utah for the fall semester, majoring in psychology. I have a passion for helping people, and I want to become a life coach so that I can help others to live the lives that they want to live. I'd like to thank the scholarship committee, the National Federation of the Blind, and President Riccobono for this opportunity and for letting me be a scholarship finalist. I'd like to say that you will not regret this, and I will be paying it forward and helping others in my career. Thank you. Johna Wright, Georgia, Georgia: Hey, everybody. First I just want to say thank you to Chairman Patti Chang, the scholarship committee, and the entire Federation for giving me this opportunity. I never thought growing up as a kid in small-town Georgia that I would be at the National Federation of the Blind convention, but it is amazing. I will be attending Mercer University this fall as a double major in psychology and holistic education to achieve my ultimate goal of becoming a teacher of the visually impaired. I believe that all children should have access to equal education and not feel excluded or alienated in any way. I love to advocate, so that's why I plan to be a TVI [teacher of the visually impaired], and I also plan to maybe hold a leadership role in the NFB one day. Again, thank you so much for having me here today. Thank you, Federation family. Thank you, Patti Chang, members of the committee, President Riccobono, every single one of you that believed in me. Before I joined the Federation I didn't have a horrible life, but I settled. I settled for having a less independent life. I settled for not doing everything for myself. I settled for not achieving the best that I could achieve. You all believed in me; the National Federation of the Blind does not settle. We tell parents, "Do not settle for less than the ultimate, excellent education for your children." We tell students, "Do not settle when your materials are not accessible, and you cannot get your textbooks." We tell parents, "Do not settle when you are being denied the right to parent as a blind individual." We tell our children, "Do not settle when you are not allowed to participate in activities." And so I just want to say thank you for teaching me not to settle. I'm a teacher of blind students in Washington, DC, and every day I see how students are settling and parents are settling. I plan to do research on learning reading media assessments so that we can prove that our children do need Braille. Because we will not settle until we get it. Thank you so much, and we can all live the lives we want. Following is a complete list of 2016 scholarship finalists and the awards they received. In addition to the awards listed below, each finalist also received: $1,000 and additional prizes personally donated by Dr. Ray Kurzweil; $1,000 from Google and the newest Chromebook; and a $1,000 certificate to the purchase of Independence Science technologies, specifically the new Sci-Voice Talking LabQuest. $3,000 NFB Scholarships (15): Tara Abella, JJ Aragon, Deniz Aydemir-Doke, Danielle Burton, Nathan Clark, Deanna Greco, Nazanin Heydarian, Matthew Miller, Katy Olsen, Chelsea Page, Donna Posont, Dexter Rowell, Kennedy Stomberg, Corgan Waters, and Johna Wright.